An essential experience for anyone interested in 19th-early 20th century German art - though it doesn't quite support its thesis. The Louvre's latest show starts off strong: visitors first enter a rotunda featuring an eponymous three-wall mural by Anselm Kiefer (1982-2013 - it vaguely resembles a stage set for a forest of birches), and then proceed to an anteroom to see Tischbein's Goethe in der Campagna (1787). Even in the age of mechanical reproduction and simulacra and simulation I still find it interesting to see the original versions of iconic works of art "in person" - so the inclusion of this piece was a pleasant surprise. Building on the Tischbein painting, "Apollo and Dionysus" begins by exploring German artists' fascination with Italy in the early 19th century. 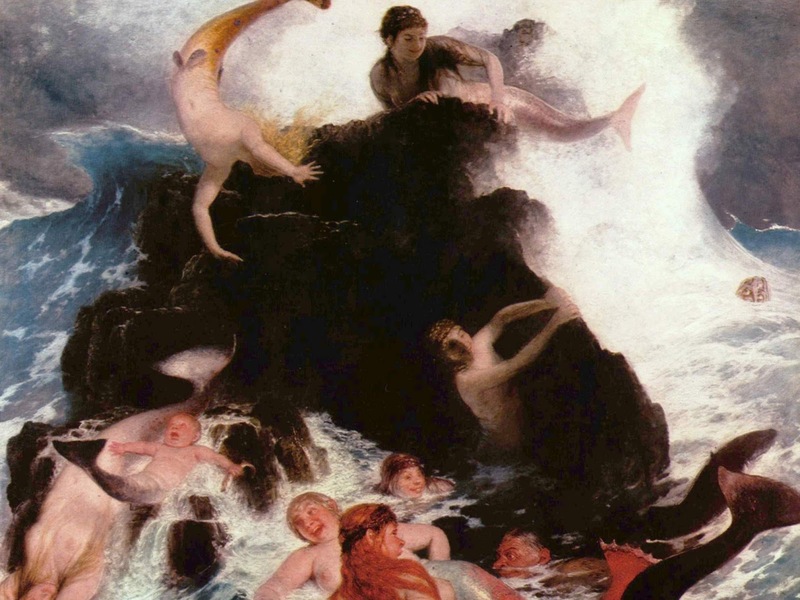 The section features Nazarene artists and their associates - who rejected the Neoclassicism of the Englightenment era in favor of art inspired by the Renaissance. Accordingly, their work strongly resembles that of the Pre-Raphaelites - all brilliant colors and attention to detail. 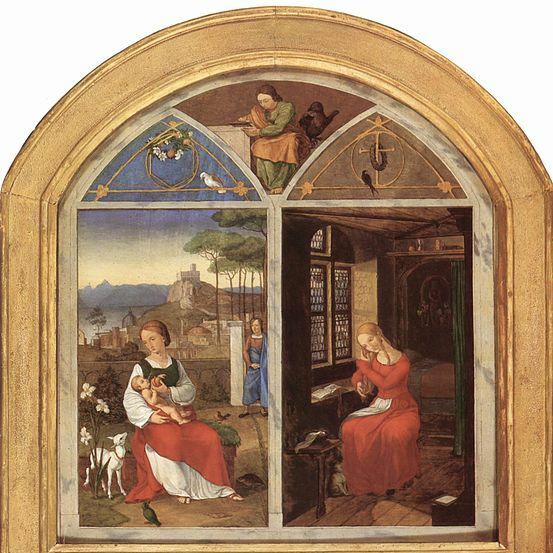 Featured artists include Johann Friedrich Overbeck, Franz Pforr, and Julius Schnorr von Carolsfeld. Pictured here: Pforr's Sulamith and Maria (1811). The clear lines of the Nazarenes and their largely Christian subject matters gradually make way for blurrier brushstrokes and - frankly - kitscher depictions of more heathen themes, like Lovis Corinth's Perseus and Andromeda (1900) in the last room of section 1. It's a broad collection of works grouped into interesting subcategories, though the relation of the works to the Apollan / Dionysian dichotomy could have been addressed more clearly. Goethe's scientific sketches thus go quite well with the selection of Paul Klee's works featured here. 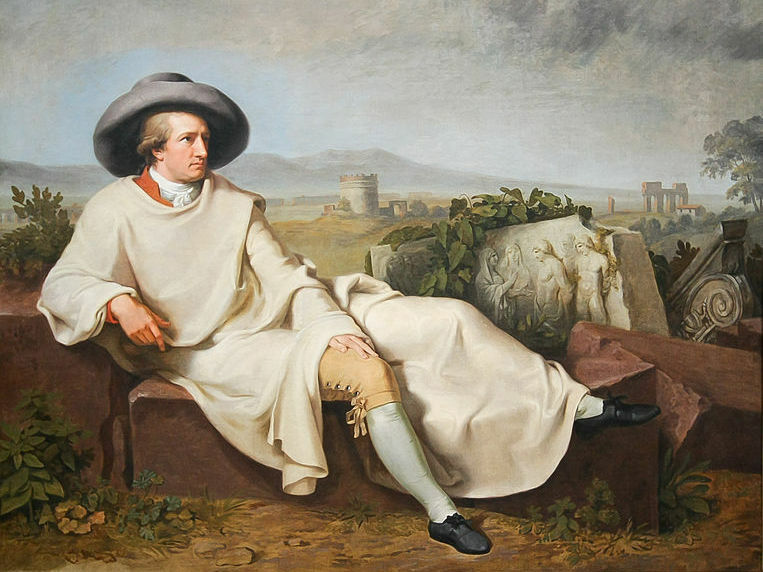 The second part features Romantic landscapes - though the link between these and Goethe's theory of color isn't completely tenuous, it could have been explored in more depth. 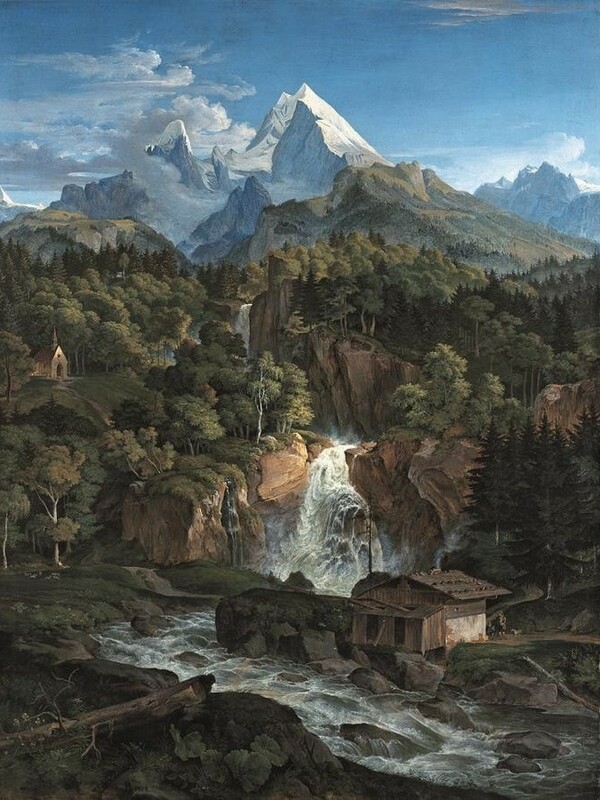 Caspar David Friedrich features heavily here, but there are also paintings by Joseph Anton Koch and Ludwig Richter; below is Richter's Watzmann (1824 - the mountain is Germany's third-highest peak and even has its own [German] website). "Ecce homo", the last part of the exhibit, focuses on post-WWI art - and is as such heavy on the groteque, traumatic, and just plain disturbing. 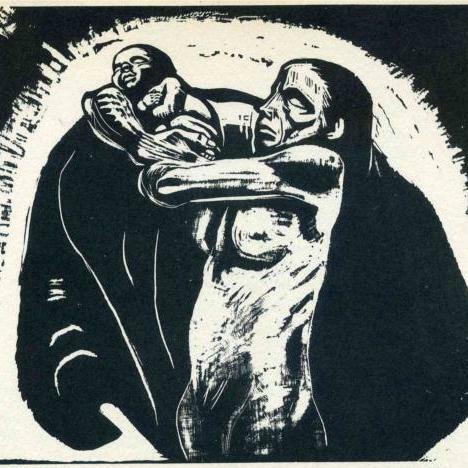 Works include: Käthe Kollwitz's cycle War - e.g. The Sacrifice (1921-1922). 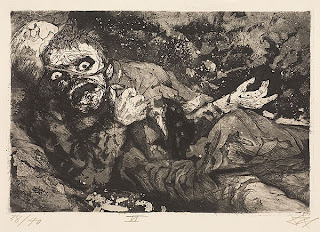 Otto Dix's cycle on war from 1924 - pictured here: Wounded Soldier. 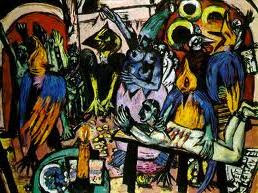 Max Beckmann's Hell pieces - though I'm not sure if this painting, Birds' Hell (1938), is strictly part of the cycle. 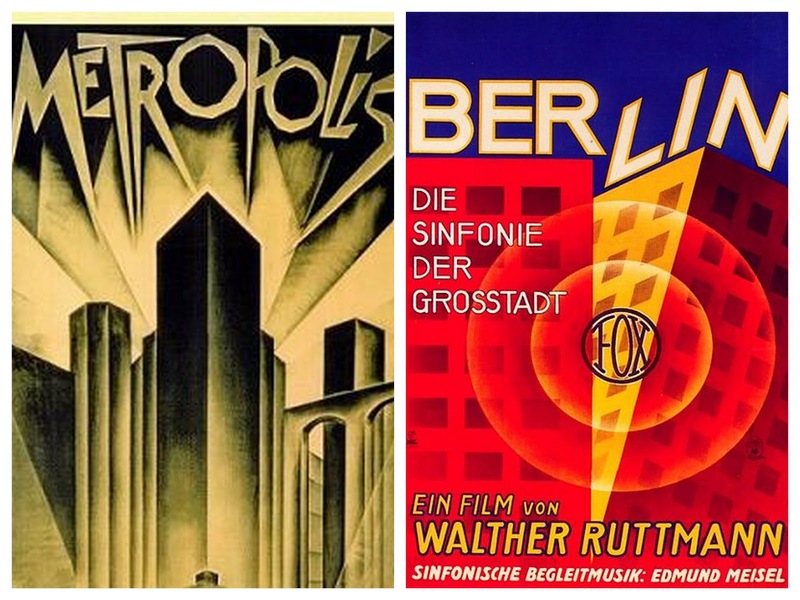 The exhibit also features four films: Metropolis (1927), Berlin: Symphony of a Metropolis (1927), People on Sunday (1930), and Olympia (1938). Though De l'Allemagne ends on a powerful note with "Ecce homo," it is nonetheless somewhat incoherent. This is likely due to the sheer breadth of the selected period: 1800-1939 was a time of tremendous and fast-paced change in what is now Germany, and any "reflection on the themes structuring German thought" for this entire period would invariably have to focus on certain elements while cutting out others. However, it is surprising that the exhibit largely elides the significance and repercussions of the emergence of the modern nation-state and nationalism, i.e. the formation and evolution of "Germany" - which is perhaps the key theme structuring "German thought" during this time frame. To contextualize the paintings, timelines of when the featured artists lived and worked together with key historical events (like the 1848 revolutions), as well as maps of the emerging country's changing frontiers, would have been helpful. Potentially, the political dimension is kept low-key deliberately. Though De l'Allemagne is part of the "50 Years of German-French Friendship" celebrations to commemorate the signing of the Elysee Treaty (viz. the Buddy Bears featured in November), it has to navigate through time periods where France and Germany were not on the best of terms: specifically the Napoleonic occupation, the Franco-Prussian War, and World War I. Further, the reasons behind the structure of the exhibit could have been justified more explicitly - as it is, the different sections seem inconsistent. Part 1 includes art from the late 18th century to the turn of the 20th and Part 2 goes from the 1790s to 1939; but Part 3 only focuses on 1919-1939. 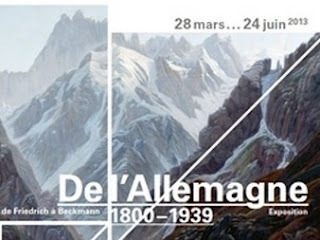 It would have been interesting if the exhibit had focused on the permutations of themes that ran through German art persistently from 1800 to 1939. 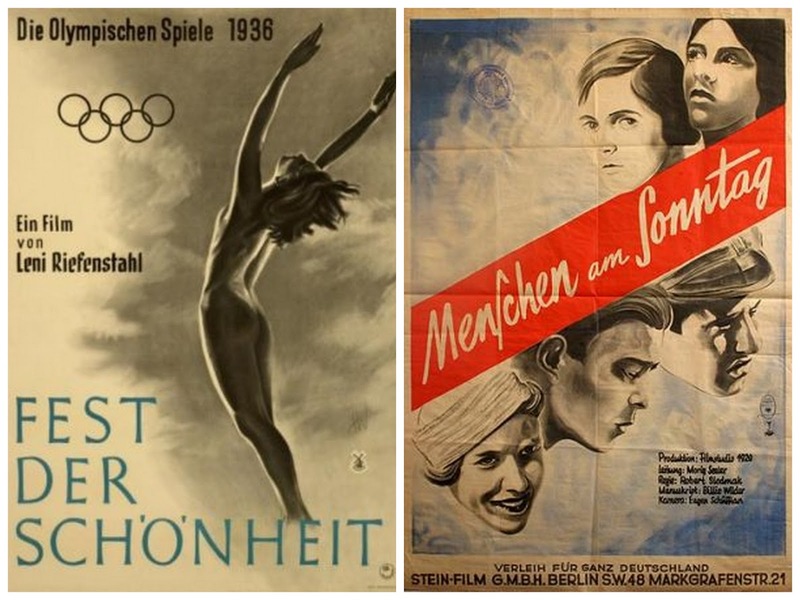 None of these criticisms should deflect from the fact that the exhibit is a must-see for anyone with an interest in German Romanticism / the Nazarenes / Goethe / post-WWI German expressionism and New Objectivity. The juxtaposition of Goethe and Klee is especially effective, and "Ecce homo" is very raw. The next time I'm at the museum I plan to get the exhibition catalogue, which I hope includes curators' essays explaining the reasons behind their choices, thus answering my questions about their decisions. I call it the 19th century PG-13 Lisa Frank equivalent. List of image sources in under development.